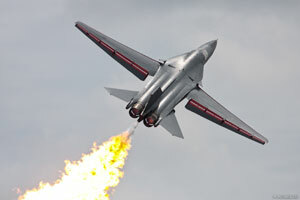 The unusual swing-wing F-111 entered Australian service in 1973 and has been an iconic part of national celebrations since. Australia Day, the New Years celebrations and Riverfire just won't be the same without an F-111 roaring past doing a "dump and burn". All photos courtesy RAAF SQNLDR McCreath - thanks! There's more photos and discussion in this thread.